During the tunnel design phase, it was decided that the tunnel route should travel inland and deeper underground in order to bypass one of the few residential areas along the alignment. Designers introduced an isolated curve in the tunnel alignment of 150m radius, requiring the TBM to be designed with a unique back-up system. 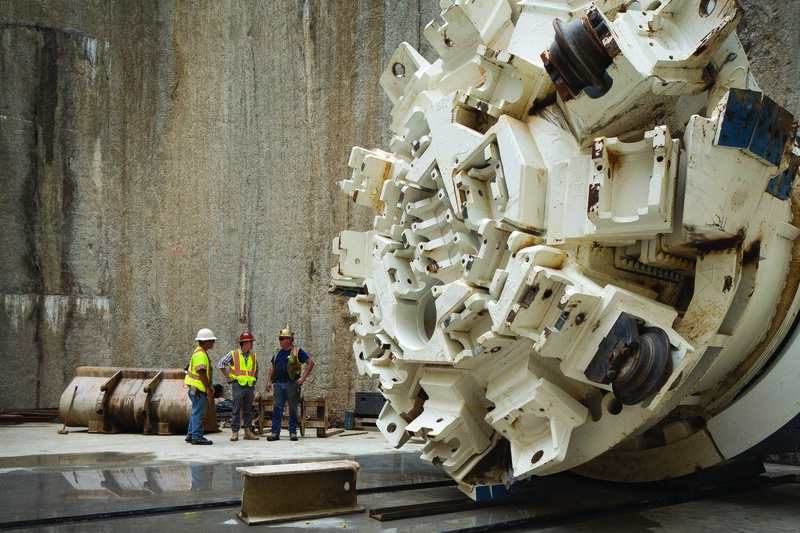 There will also be operational procedures when crews navigate the tunnel curve, requiring the machine to be operated using half strokes rather than a full TBM stroke. The curve is not the only unusual aspect of the tunnel; in fact, a tunnel on this scale has not been built in the Hawaiian Islands before. Everything from the logistics of the tunnel operation to pre-grouting sections ahead of the TBM for groundwater control are new to the Aloha State. Director of Southland, Tim Winn, elaborates: “There has not been a Tunnel Boring Machine of this size in the Hawaiian Islands or a tunnel of this length. The tunnel is being driven from an active Water Treatment Plant (WTP), and space is at a premium. There are also simultaneous contracts being performed there outside the scope of our work.” He adds that although there have been challenges, teamwork has been key: “Robbins Field Service has been extremely valuable during assembly and commissioning of the TBM.” As of June 2015, the TBM has excavated more than 300m, and is boring at a rate of 12 to 15m per day in basalt rock. Rock bolts, steel arches, wire mesh, and ring beams are being installed as necessary. The JV is building the Kaneohe-Kailua Wastewater Conveyance Tunnel for the City and Council of Honolulu, which will improve wastewater infrastructure by eliminating overflows during rain events.